The Three Paragraph Essay is a resource that is best used for novice essay writers. It is a great way to introduce the expository essay. 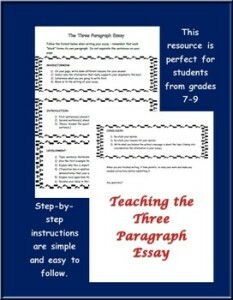 The 2 page pdf document includes simple step-by-step instructions to teach students how to write an effective three paragraph essay. I recommend using this document with students who are in grades 7-9. It is an effective and simple way of learning how to write a proper introduction, a one paragraph development, and a conclusion that serves a purpose.